Coachella breaks ground today on a new 15,000-square foot Spanish revival style library and conference center that will help transform the city’s historic Pueblo Viejo into a vibrant educational and cultural center. 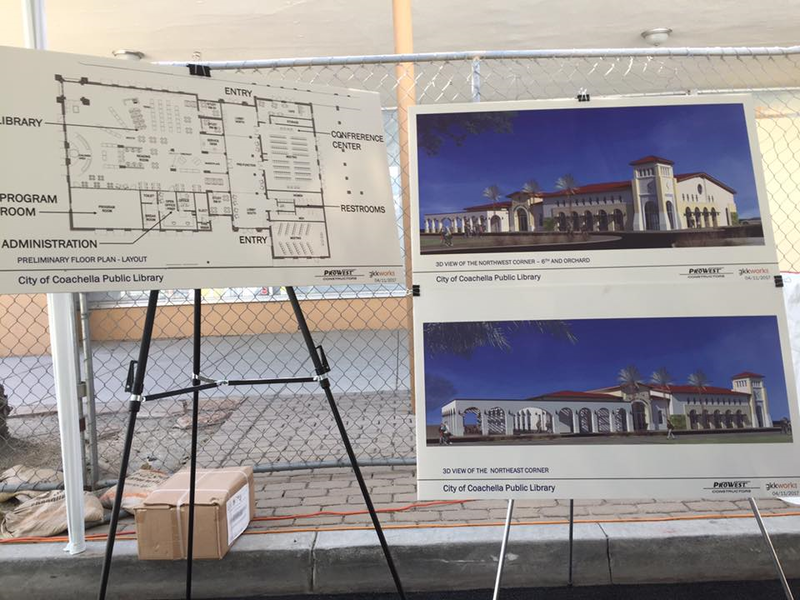 Located across the street from City Hall at the corner of Sixth Street and Orchard Avenue, the new library and conference center will feature Spanish style arches over its doors and windows, clay tile roofs, a wooden shade trellis as well as scenic outdoor gathering spaces with a decorative fountain. The library and conference center will also include an iconic bell tower that will be visible from many areas of the city. “This project is going to completely revitalize our downtown,” said Coachella Mayor Steven Hernandez, adding that the grand opening for the library and conference center is targeted for October 2018. 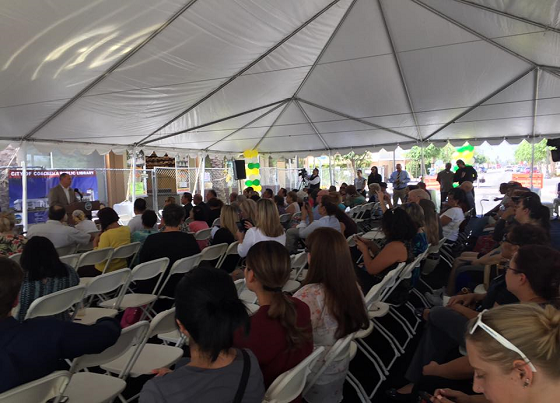 Educational programming for the library is also being developed with input from representatives of College of the Desert, Coachella Valley Unified School District, Riverside County and the Mexican Consulate, several of whom are scheduled to speak at today’s groundbreaking event. The new 8,250-square foot library will be built on a 1.6 acre site on the corner of Sixth Street and Orchard Avenue, across the street from City Hall. The new library will be more than twice the size of the city’s existing 3,500-square foot library and will include three study rooms, a program room as well as separate reading spaces for children, teens and adults. The 6,650-square foot conference center will include three meeting rooms, space for a cafe that faces Sixth Street as well as its own pre-event lobby area. The library and conference center will also include a 900-square foot lobby that can be used for special events and programs as well as a 34,000 square foot park that includes a landscaped paseo, outdoor reading spaces, meeting break out patios, greens screens and beautiful landscaped areas. Hernandez said the library and conference center project reflects three years of planning, including input from an 18-member Library Ad Hoc Planning Committee that met monthly between October 2013 and November 2015. A public opinion poll in 2015 found that local residents would support a one cent sales tax increase for a new library and other city services and after voters approved the tax increase in the November 2015 election, city officials designated funding for the $11 million library project. Coachella has hired Wildomar-based ProWest Constructors and Irvine-based gkkworks to design and build the city’s library and conference center. For more information, please visit www.Coachella.org.